FutureE is supplying its Jupiter hydrogen PEM fuel cell systems for backup power applications in Chinese banks. The German fuel cell systems specialist FutureE Fuel Cell Solutions GmbH – which was recently acquired by Heliocentris Energy Solutions – has signed a distribution agreement with a leading IT banking solutions provider in Beijing. The hydrogen PEM fuel cell systems, which have output powers ranging from 5 kW to 18 kW, will replace the traditional battery solutions throughout Chinese banking networks. 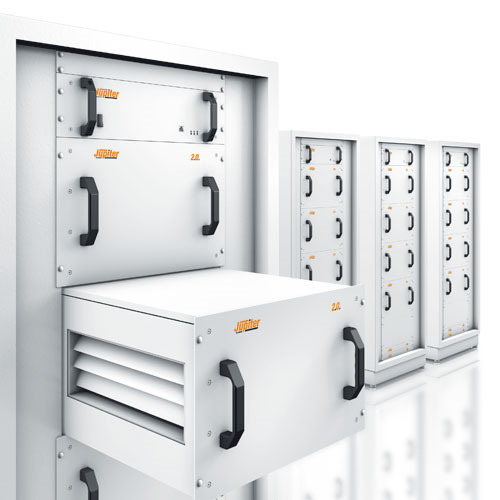 The master distribution agreement covers FutureE's Jupiter backup power fuel cell systems for Chinese banking customers. The contract aims for delivery of at least 300 such systems in 2015, and has a potential sales value of €12 million (US$16 million). Both parties expect significant market growth for fuel cell based systems in China in the coming years, driven by further reductions in production costs. In addition, there are Chinese government initiatives aimed at the rapid introduction of fuel cell technology in China. FutureE Fuel Cell Solutions GmbH is the leading supplier in central Europe of stationary fuel cell applications for telecoms and industry, specialising in the design of customer-specific energy solutions. Heliocentris Energy Solutions’ flagship Energy Manager enables smart connectivity between different components in hybrid energy supply clusters, such as batteries, solar panels, diesel generators or fuel cells. Berlin-based Heliocentris is currently targeting base stations of mobile telecom operators in regions with poor and unreliable grid coverage, such as the Middle East and South East Asia, with several hundred systems installed.